Looking for user insights? Oracle news? Proven solutions? Whether you're on premises, in the cloud or anywhere in between, we've got you covered. Subscribe to these channels, and also check out The Hub. Read practical articles on implementation techniques, case studies, and more in each quarterly issue. 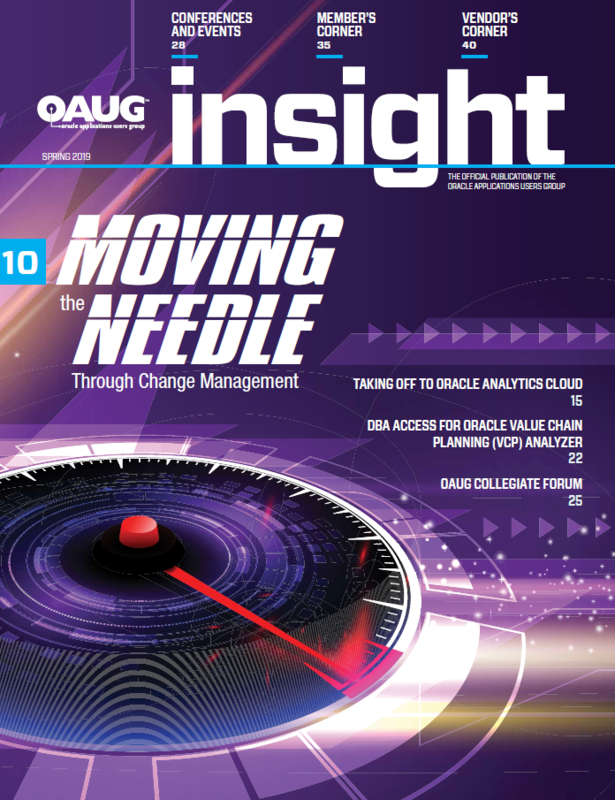 OATUG Insight magazine is available exclusively to employees of OATUG member organizations. The latest edition of OATUG Insight magazine is available online. OATUG Insider is a weekly source of aggregate news from all over the Internet. The OATUG Insider provides relevant content to Oracle Application Users including headlines relating to Oracle, Business, Technology and Industry. Rely on the insights and experiences of other Oracle Applications users to ease and inform your path to the cloud – whether you’re remaining with on-premises solutions for now, moving rapidly to the cloud or extending functionality in a hybrid environment. OATUG eNews is a monthly electronic newsletter packed with updates and information about OATUG initiatives, educational opportunities, conferences and special events, GEO and SIG meetings, Oracle announcements, and new product information. OATUG Blogs provide readers with professional tips and tricks, advice, and more. With regular updates, we provide the latest content in the industry. Turn to the OATUG Buyer's Guide for how-to guides, case studies and more for insights and guidance on your projects. Find out who's who and who can help in this go-to catalog of solutions and solution providers for your Oracle Applications environment. Explore useful videos on programming, application updates, case studies, techniques and more in less than five minutes. The OATUG offers a number of resources through which you can receive the latest in Oracle Applications information.